Some time ago we whined long and hard about T-Mobile’s Inexplicably Stupid Upgrading Policy and kept on moaning straight through to write Part Two, a few days later. Our tree was rattled when we tried to bag a new T-Mobile G1 on contract, confident that our ten years – count ’em! – as a loyal paying customer with T-Mobile would surely be rewarded with handsome discounts all round. Sadly, we swiftly learned that in T Mobile’s world, a punter coming off the street is worth a whole load more than a loyal customer – to the tune of a hefty £305 penalty coming our way. Fast forward to today and we decided to take advantage of their new attractive range of rolling SIM-only deals, offering some competitive deals on rolling monthly contracts. 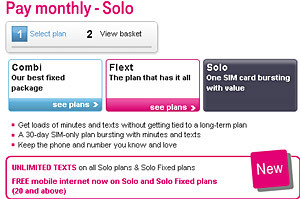 Mindful of the tempting similar deals being offered by 02, T-Mobile now serve up five 30-day contracts, all packing unlimited texts and all but the cheapest deal offering ‘free mobile Internet,’ pegged at 1GB/month. After eBaying ourselves a cut-price G1 phone as a handy stopgap before the much anticipated Palm Pre hits these shores, we thought that one of these rolling deals would be just the job. We figured we’d be able to sell on the G1 when the Pre arrives and not be stuck with a lengthy contract. Naturally, being T Mobile, this was to prove a tedious process with a slight suggestion that they’re not that keen on their current contract customers shifting downwards to this sharper deal. After finally getting through to a human bean in the afternoon (20 minutes of endless Duffy as our on-hold music), our chirpy assistant suddenly cooled when we told her that we weren’t interested in another 12 month contract and were looking to scoop a bit of their rolling SIM action. Curiously, that seemed to instantly fuse the entire ‘internal web site’ for the afternoon, and we were told to call back in the evening. Our seven o’clock call was greeted with twenty minutes on hold (yes, with Duffy playing the entire time), before finally getting through to an assistant who insisted that it was not possible to change our contract to the advertised deal without a call to the much maligned loyalty’ department being made. Another excruciatingly long wait ensued, with the familiar racket of Duffy – yes the entire album – starting up again. By now we were really beginning to suspect that this was another dastardly tactic designed to deter monthly customers switching to the new deal. A man can only take so much Duffy after all. Eventually, the Welsh chanteuse was silenced, with a cheery, older Welsh lady coming online to OK the change to our account. All was going well until we mentioned that we’d be using a G1 handset. This seemed to act as a keyword to an instant price rise, with the lady immediately insisting that the phone demands increased expenditure just for being connected to their service, to the tune of another £12/month. Stubbornly, we declined to hand over another £12/month just because of the phone we were using, but we’ll keep you updated as to developments when we switch deals next week. In the meantime, we’ll take a look to see how much unlocking the phone will cost, as O2’s deal is starting to look more attractive by the minute. How did you get on with using your sim in the G1. Are they bluffing by saying you cant use the solo sim? That sounds like a really annoying experience you’ve gone through, I already hate the long waits we have to go through to get help from these mobile phone providers and having to listen to Duffy would have just made me cry! Also I dont understand why there isnt the option to turn the 3g connection on the G1 off?! Surely this is wasting a huge amount of battery life. Anyway, if you do decide to switch to a sim only again, i run a website that compares SIM Only Deals which i thought you might find useful. Thought you’d be interested – I ordered a £20/month SIM only from the T-mobile website. Not only did I skip the Duffy ear-bashing but also have no problems using it in my G1 handset. Only problem was that as a new customer I could not make international calls for the first three months (even if I pre-paid the £5 to buy a bundle of minutes).